Several of us plan to attend the NEAF event each year. We enjoy this show as there is nothing quite similar to it on the East Coast and each year it appears to get a bit larger with new exhibitors and more astronomy related items to check out. Many of the familiar mainstream companies as well as many other firms attend to exhibit their latest offerings and sometimes new products for a hands on viewing. This year four of us drove from Maine to Suffern, New York for the show. George Whitney, Rob Burgess, Ron Thompson - experiencing this for the first time and I, left Friday afternoon, spent the night in the area and attended the show Saturday, May 6th, driving home later that afternoon. After last year's event I’d contacted Don Holcombe of ScopeGuard and indicated he really should plan to attend this year as he would meet many of his customers and have an opportunity to enjoy the exhibits. He decided to take me up on this idea so Don and his associate, Rick Oxenreiter, flew east so a couple of Texans were added to the vendor list. I’d indicated to Don I would assist in manning his booth should he require me to do so and I did spend time doing this, but mostly it was simply hanging out enjoying talking with Don and Rick. It was a great visit. I was impressed with Don’s memory as the various folks came up to speak with him. He appeared to remember each customer and their instrument case requirements they had emailed about and discussed. Left - Mr. Don Holcombe of ScopeGuard. Above is a photo of Don and Rick manning the ScopeGuard booth. Don indicated he’d taken multiple orders over the course of the day and he had another full day to go on Sunday. George took this image of the three of us together. I didn’t do this photograph much good by being involved but I really do like these guys. The photo at left is of the display area of Rivers Camera from Dover, New Hampshire. Rivers is the nearest firm with astronomy equipment to our home area and they have been good to our club members on purchases and advice. Below - Steve Walters with George in the background, speaking with the Daniel Wisehart of Yankee Robotics pursuant to the new generation of Trifid CCD cameras. Their new gold series cameras are going to be wonderful imaging tools. Left - Tom Peters of DiscMounts, Inc. demonstrates his product to some NEAF attendees. Below – The Astro-Physics display area was a busy all day long with astronomers checking out their new Mach1 GTO mount, 160mm EDF telescope and prototype 140mm refractor. This was the first opportunity George and I have had to meet Roland and Marge personally. Left – Al Nagler of TeleVue reviews the operation of his new 127mm telescope imaging system as Jim Burnell, George, Rob and I listen intently (I shot the image so am not in view). Jim has been working with TeleVue on this system for some time and it appears to be a terrific set up. Speaking with Jim is always a highlight of NEAF each year. We often wondered why TeleVue, a firm that produces such great optics in eyepieces and telescopes didn’t do more with imaging systems. This new generation of imaging scopes should prove to be outstanding. This is a close up of the new 127mm system. Both the guidescope and primary have digital focusers; the blue scale on top is the digital read out for repeatable focus. The wide mouth tee ring at the camera and series of adapters between the camera and the focuser allow flexibility to achieve the exact distance for the camera to focus. Note the three thumb screws in view: these are used to tighten down the camera rotator, a really great device in an imaging system. Wondering what George is thinking about? Well I know… He’s debating whether or not to purchase the new Takahashi Epsilon 180ED F/2.8 on display at the Hands on Optics booth. In the end result, he did indeed place this order although it may be three or four months before he receives the instrument. NEAF is a great place to make this type of purchase because if you’re ever going to get a deal or discount it’s at this event. I’m really pleased about this purchase as well because I’ve been thinking about this telescope since viewing one at the AIC event last year. This scope with the STL-11000M will be a great imaging platform for comets and other widefield objects. This purchase also put George in the ‘top spender’ category for our group this year. He had Don measure the OTA for a ScopeGuard case before we left the display floor. This group of characters consists of daylight astronomers - solar observers. Every year the solar observing section of NEAF has grown some headed up by Barlow Bob and others. Here we have Ron Thompson of our group, Ralph, aka known as the (Great and Grand) Poobah, George and Ron. Ralph and Ron are from New Jersey and it's always a pleasure when we run into them again. Here is the man himself... 'Barlow Bob' the 'Godfather of Solar Observing' and a good friend. I had George get a photo of us because we just never seem to get around to it. Below is the observing field that Bob and his associates set up for the NEAF attendees. Ron and the Poohbah on the observing field. An outstanding solar system in the field. 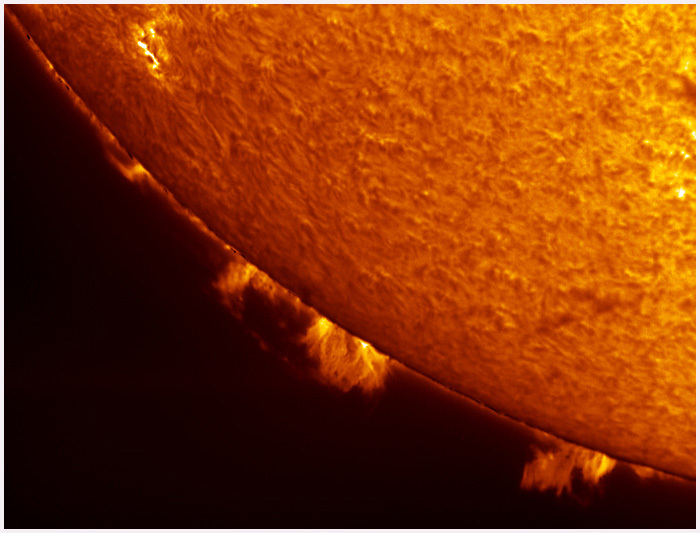 with a .5 Angstrom stacked Coronado SolarMax 90 telescope owned by Greg Piepol. Gary Palmer, enjoys a solar view through the Astro-Physics refractor.